Fuzzy Duplicate Finder for Excel is wonderful Excel plugin will polish off all typos and misprints from your Excel workbooks. It quickly finds and removes partial, or fuzzy duplicates, typos, misspelled words and similar records within a list or a selected range. Fuzzy Duplicates Finder searches for duplicates that differ in 1 to 6 characters. It also recognizes lost and inserted symbols. It supports Microsoft Excel 2007, 2003, 2002 and 2000. - Quickly find and remove all possible typos, misspelled words and duplicate entries in Microsoft Excel worksheets. 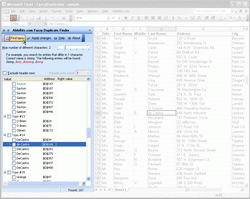 - Search for fuzzy excel duplicates in a whole list, a column or a selected range. - Have all duplicate records displayed in a clearly arranged table. - Make all possible corrections in the search results: removing records, setting the right values, etc. - Correct all or some fuzzy duplicates in Excel automatically or manually. Qweas is providing links to Fuzzy Duplicate Finder for Excel 3.5.0 as a courtesy, and makes no representations regarding Fuzzy Duplicate Finder for Excel or any other applications or any information related thereto. Any questions, complaints or claims regarding this application Fuzzy Duplicate Finder for Excel 3.5.0 must be directed to the appropriate software vendor. You may click the publisher link of Fuzzy Duplicate Finder for Excel on the top of this page to get more details about the vendor.